Bay Area Discovery Museum 557 McReynolds Rd., in East Fort Baker, Marin Headlands, (415) 339-3900. Tu-F 9-4, Sat-Sun 10-5. $10, 62+ & 1-17 $8. Free on 1st W of month 9-4. This activity-oriented, hands-on museum designed especially for children 6 months to 8 years old is especially nice as a rainy day outing. Themed areas include a Tot Spot for toddlers, where they can splash in an outdoor flume and crawl through several padded indoor rooms; an Art Studio with sections for both older kids and younger ones; Lookout Cove outdoor play area featuring Bay Area icons; a Wave Workshop where kids can explore waves in an experimental setting; San Francisco Bay Hall with an “underwater” tunnel and play fishing boats. The excitement is contagious, and parents find themselves being pulled along from one activity to another by their eager children. Visitors can also explore the outdoor area immediately surrounding the museum. Good advice: Arrive early, bring a lunch, stay late. “Shall we move on?” was always met with a firm, “No,” from our 18-month-old. Note: the cafe is currently closed; changing tables are found in the men’s room here, too. More things to do in Sausalito. 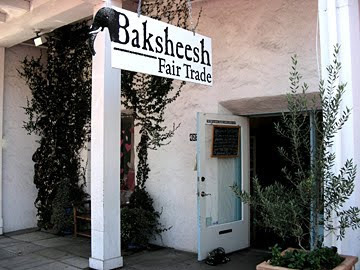 Baksheesh Fair Trade 423 First St. West, (707) 939-2847. M-Sat 10-6, Sun 12-6. This unusual shop strives to trade “fairly with artisans in the developing world and the U.S.” The goods are reminiscent of what you see in souvenir shops as you travel the globe. I saw familiar neck scarves like some I bought recently in Thailand and Egypt, but also saw some lovely print tablecloths from India and elephant dung greeting cards from Sri Lanka, where I’ve never traveled. House of Curries 2984 College Ave./Ashby Ave., (510) 841-1688. L-D daily; $. Service at this Pakistani-Indian spot is bare bones. Patrons pay in advance and secure their own utensils, water, and complimentary hot chai. Among the tastiest items on the expansive menu are spicy vindaloos, tandoori lamb chops, and rice biryanis. Daily specials and a large selection of vegetable curries--including a delicious eggplant--are also available. Things to do in nearby Eureka. Scoma's Restaurant Pier 47, on Al Scoma Way at Jones St./Jefferson St., Fisherman’s Wharf, (800) 644-5852, (415) 771-4383. L-D daily; $$$. Reservations not accepted. Free valet parking. Hidden away from the touristy bustle and featuring a prime waterfront location, this old timer is reached via a back alley leading out over the area’s actual wharfs. Built from a modest coffee shop and using the owner’s family recipes, it boasts a pleasant old S.F. ambiance, big windows with views of weathered boardwalks and fishing boats, and a professional waitstaff. And since it is the only restaurant in San Francisco with a commercial license to buy right off the boats, it's hard to beat the fresh seafood selection. Meals begin with exceptional sourdough bread made by Boudin especially for the restaurant (they use 175 loaves on an average day). When at capacity, two separate kitchens keep the wait short. Menu items are organic when possible, and an active effort is made to recycle. The menu includes everyone’s favorites, many of which are house specialties--Lazy Man’s cioppino, fried calamari, clam chowder, crab cakes. The chef also prepares perfect scallops and a delicious crab risotto studded with fresh peas, and house-aged Angus beef is available. 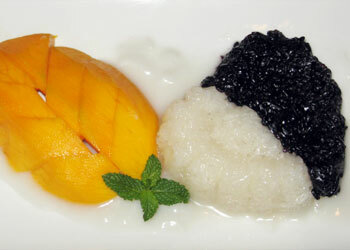 Baan Thai Restaurant 99 Orinda Way/near Camino Pablo, (925) 253-0989. L-D daily; $. Set along a quiet leafy street and featuring a simple, pleasant decor, this spacious two-room Thai spot has multi-paned windows looking out to the sidewalk and wood banquettes lining the walls. Delicious pumpkin, mango-chicken, and panang curries are available; the Thai crunch salad and oriental chicken salad are also good choices. Smokey eggplant with chicken, tofu, and Thai basil is another personal favorite, and a “veggie lover menu” offers many selections. Heat is light, so request that dishes be made more spicy if that is the way you like them. Brown rice is in actuality a plump, chewy red variety with a nutty flavor. Sticky rice with mango is the dessert of choice, but when that isn’t available coconut ice cream with fried bananas is a good second. Lunch specials include a salad. Sol Food 732 4th St./Lincoln Ave., (415) 451-4765. B-L-D daily; $$. No reservations. Though this teeny, tiny Puerto Rican spot features a festive atmosphere, it has only several short counters of seating. Less appetizing seating spills into the parking lot. Check out the super cool website and plan your meal ahead. Signature dishes include: pollo al horno (boneless, skinless, flattened chicken thighs served with pink or black beans and sweet (soft and juicy) or garlicky (crispy and flat) fried plantains); camarones criollos (large prawns sauteed in a delicious tomato-garlic-onion sauce and served with rice, avocado, and plantains); and pressed sandwiches—the jibaro features steak, garlic mayo, and crunchy garlic plantains, and the Cubano has roast pork, ham, mustard pickles, and Swiss cheese. Vinegary hot sauce on the table adds to the flavor, and a heavy plantain keeps napkins from blowing away. Fresh limeade and orange-mango iced tea are served up in mason jar glasses. If the crowdedness of this small take-out place sounds unappealing (the kitchen here is stuffed with almost as many cooks as the counters are with diners), or if it is overflowing when you arrive, opt for their branch at 901 Lincoln Ave./3rd St., (415) 256-8900. It is just a block away and has much more seating, but it doesn’t serve breakfast and can also get very crowded with happy diners. More things to do in San Rafael. This is now the Velvet Room. La Costanera 8150 Cabrillo Hwy. (Hwy.1), (650) 728-1600. D Tu-Sun; $$$. 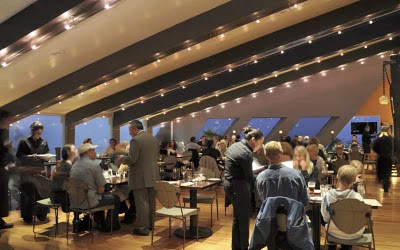 Perched on a bluff above the ocean, this restaurant has three levels, with high ceilings and tall windows that provide a spectacular ocean view for everyone. Wood chairs with metal frames and a swivel back are particularly comfortable. So it is a surprise to have the added pleasure of a menu featuring deliciously prepared contemporary Peruvian cuisine. The way to go with the extensive menu is tapas and pisco sours. Ceviche/cebiche (seafood marinated in, and cooked by, citrus juice) is the national dish of Peru, and here it is prepared with a variety of fish and shellfish and served with enhancing sauces. The halibut version is embellished with crunchy fried dried corn kernels, that alone is good enough reason to order the dish. A tasting of three causas (mashed potatoes) is served in a row of colorful scoops (our waitress informed us that 236 kinds of potato are grown in Peru!). A highlight is choclo Peruano (Peruvian corn with huge kernels, flown in from the mother country, grilled on cob, and topped with a tasty cheese-red pepper sauce). Choose a fried chicarrones--delicious chicken, fish, calamari, or portabello mushrooms--and crispy yucca balls stuffed with chorizo are a must. The entrée menu includes some larger portion delights: adobo de chancho (pork shoulder slow braised in dark beer); lomo saltado, also referred to as the Peruvian national dish (a stir-fry of beef tenderloin, onions, tomatoes, cilantro, and soy sauce; seafood paella. Octopus and mussels appear in several dishes. Dessert brings on a refreshing passion fruit panna cotta as well as alfajores and flan, and brewed coffee—not Nescafe, as is the disappointing standard through South America. The downstairs bar opens onto a sheltered outdoor patio with comfortable seating, heat lamps, and several fire pits. Allow time before or after to walk down the adjacent steps to the spectacular beach in front for a refreshing stroll, and don’t be surprised if you see a long line of pelicans fly by while you’re dining. More to do on Highway 1. Palio d'Asti 640 Sacramento St./Montgomery St., Financial District near Chinatown, (415) 395-9800. L M-F, D M-Sat; $$-$$$; happy hour M-F 4-7pm. Artwork in the light-filled front room here evokes the piazza in Asti where the restaurant’s namesake horse race, Il Palio, is run. A more cozy, cave-like back room features comfortable booths and a full bar (during happy hour, martinis are $1 and pizza is complimentary with drinks). The Italian menu offers a risotto, a wood-baked gnocchi, and a selection of pastas--which might include housemade square spaghetti alla Chitarra with veal meatballs, or a hearty and tasty ravioli stuffed with porcini mushrooms and ricotta and topped with wild boar sugo. 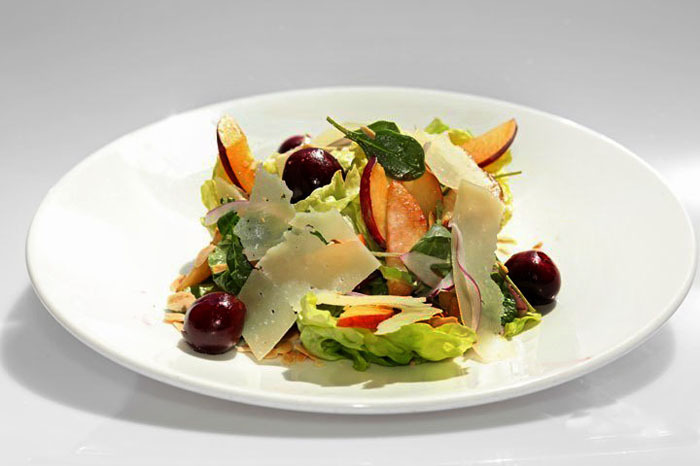 A superb summer salad features stone fruits—peaches, plums, and cherries—with butter lettuce, red onions, almonds, and pecorino cheese. Pizzas and an assortment of secondi courses are also available. The lunch menu is a la carte, while the dinner menu consists of three prix fixe menus: $29 (two courses), $37 (three courses), and $45 (four courses). 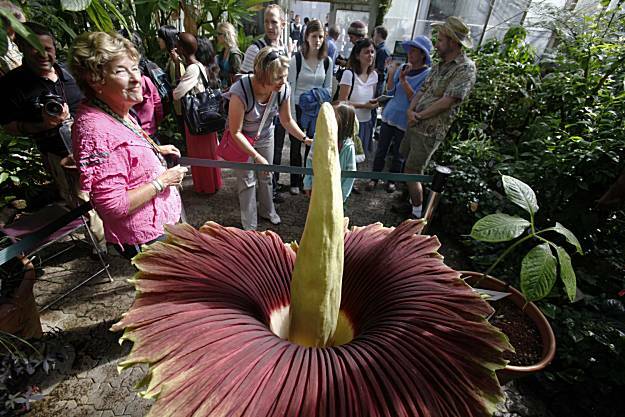 It's blooming again! The stinky corpse flower, that is. Check it out SOON!